The industrial revolution, mechanization, water and steam power, computers, and automation have given an enormous boost to manufacturing productivity. 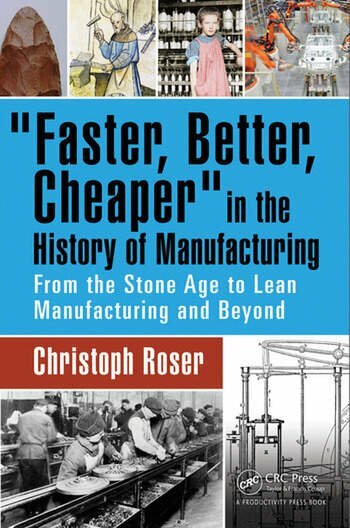 "Faster, Better, Cheaper" in the History of Manufacturing shows how the ability to make products faster, better, and cheaper has evolved from the stone age to modern times. It explains how different developments over time have raised efficiency and allowed the production of more and better products with less effort and materials, and hence faster, better, and cheaper. In addition, it describes the stories of inventors, entrepreneurs, and industrialists and looks at the intersection between technology, society, machines, materials, management, and – most of all – humans. "Faster, Better, Cheaper" in the History of Manufacturing follows this development throughout the ages. This book covers not only the technical aspects (mechanization, power sources, new materials, interchangeable parts, electricity, automation), but organizational innovations (division of labor, Fordism, Talyorism, Lean). Most of all, it is a story of the people that invented, manufactured, and marketed the products. The book shows how different developments over time raised efficiency and allowed production of more with less effort and materials, which brought us a large part of the wealth and prosperity we enjoy today. The stories of real inventors and industrialists are told, which includes not only their successes but also their problems and failures. The effect of good or bad management on manufacturing is a recurring theme in many chapters, as is the fight for intellectual property through thrilling tales of espionage. This is a story of successes and failures. It is not only about technology but also about social aspects. Ultimately, it is not a book about machines but about people! The Significance of Manufacturing – The GM-Toyota NUMMI Joint Venture. The Stone Age. The Urban Revolution – The Emergence of Society. Advances During Antiquity. The Middle Ages in Europe. Early Modern Europe. Pioneers of a New Age – The Factory System. Fire is Stronger than Blood and Water – Steam Power. Interchangeable Parts – The American System of Manufacturing. Social Conflict. Technological Advances. Science Meets Shop Floor. The Assembly Line and the Era of the Industrial Empires. Planned Economies – War, Communism, and Other Catastrophes. *Click* Let-Me-Do-This-for-You *Clack* – Computers in Manufacturing. The Toyota Production System and Lean Manufacturing. Where Are We Now?. Things to Come. "Brilliant insights regarding concepts of manufacturing systems for both practitioners and academics." - Dr. Masaru Nakano, Professor at Keio University, former manager of Toyota Central R&D Laboratories, Inc.
"What an incredible abundance of facts and information comprehensively gathered and uniquely assembled. Its thorough production presents the fastest, best and cheapest way to make each reader more knowledgeable." "This is sure to become a classic in the university curriculum to introduce students to the long history of how people improved society by making things. Roser links the progression of tools and processes from the Stone Age to emerging society to division of labor far earlier than most other scholars. He illustrates the regular progression of technology to improve productivity and closes with the future of work. Thought provoking and a necessary addition to the library of those in industry today."